Fake news you can use. Donald Trump will soon decide whether the United States will pull out of the Paris Agreement, a decision that may prove the most consequential of his young presidency. Exiting the landmark climate-change accord would not only undermine international cooperation on an issue of existential importance, but also (needlessly) sour America’s diplomatic relations with virtually every other nation on planet Earth. In the aftermath of Trump’s election, many sought solace in the thought that our reality-star-in-chief would delegate such weighty decisions to the “adults” in his administration. After all, the president is famously impressionable, forever echoing the sentiments of the last adviser who filled his ear. And White House “moderates” did capitalize on that suggestibility last month, when they averted an economic shock by deploying a series of visual aids to convince the president that abruptly exiting NAFTA (in celebration of his 100th day in office) would be unwise. But the president’s malleability is just as useful to Roger Stone as it is to Gary Cohn. And “adults” in the West Wing can be just as immature and incompetent as they are everywhere else — points amply illustrated by last week’s events. Just days earlier, K.T. 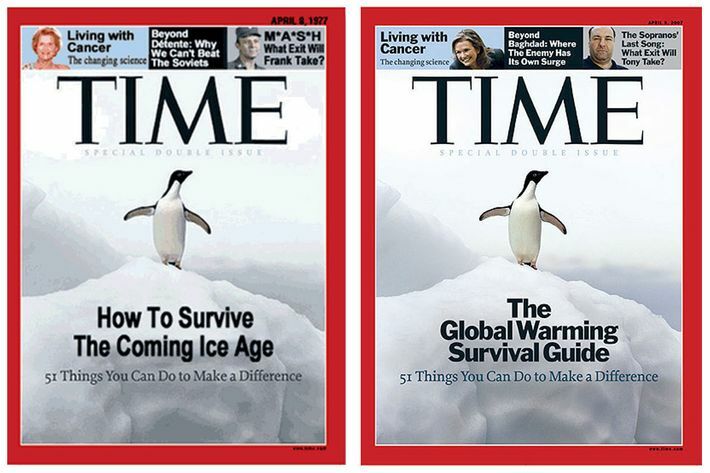 McFarland, the deputy national security adviser, had given Trump a printout of two Time magazine covers. One, supposedly from the 1970s, warned of a coming ice age; the other, from 2008, about surviving global warming, according to four White House officials familiar with the matter. Trump quickly got lathered up about the media’s hypocrisy. But there was a problem. The 1970s cover was fake, part of an Internet hoax that’s circulated for years. Staff chased down the truth and intervened before Trump tweeted or talked publicly about it. As the president contemplated the future of the Paris agreement, his deputy national security adviser briefed him with printouts of right-wing Twitter memes. [G]lobal cooling was much more an invention of the media than it was a real scientific concern. A survey of peer-reviewed scientific papers published between 1965 and 1979 shows that the large majority of research at the time predicted that the earth would warm as carbon-dioxide levels rose — as indeed it has. And some of those global-cooling projections were based on the idea that aerosol levels in the atmosphere — which are a product of air pollution from sources like coal burning and which contribute to cooling by deflecting sunlight in the atmosphere — would keep rising. But thanks to environmental legislation like the Clean Air Acts, global air-pollution levels — not including greenhouse gases like carbon dioxide — peaked in the 1970s and began declining. Anyhow, the good news is that McFarland is expected to depart the White House for the ambassadorship to Singapore, a cushy patronage gig for which she is vastly less unqualified. The bad news is that McFarland isn’t the only administration official who has tried to shape White House policy through editorially suspect content curation. The septuagenerian president has trouble navigating the internet on his own, a deficiency that gives his aides the power to dictate a hefty portion of his media diet. In recent months, certain administration officials have used that power to kill Elliott Abrams’s appointment to the State Department and get Deputy Chief of Staff Katie Walsh ousted from the White House. In the latter case, per Politico, Walsh’s fate was sealed by a story in GotNews.com, the post-Twitter-exile home of right-wing troll Charles C. Johnson. More recently, when four economists who advised Trump during the campaign — Steve Forbes, Larry Kudlow, Arthur Laffer and Stephen Moore — wrote in a New York Times op-ed that “now is the time to move it forward with urgency,” someone in the White House flagged the piece for the president … The op-ed came out on a Wednesday. 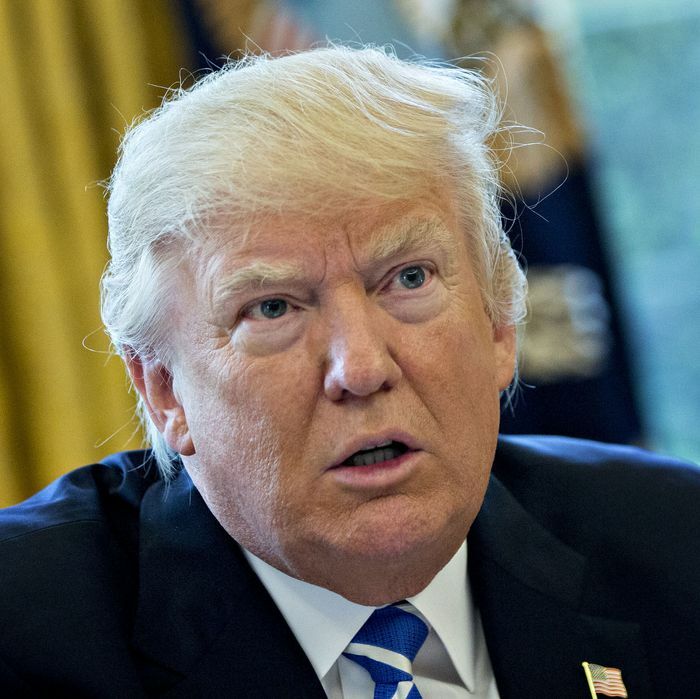 By Friday, Trump was telling the Associated Press, “I shouldn’t tell you this, but we’re going to be announcing, probably on Wednesday, tax reform,” startling his own aides who had not yet prepared such a plan. Like a small child, the president’s day-to-day behavior is deeply influenced by the media he’s exposed to. At times, this fact may yield better outcomes than we’d get from a right-wing leader with a coherent and consistent worldview; at others, it may yield much, much worse ones. All of which is to say: A man you can bait with a tweet is not a man we can trust with nuclear weapons.